Do you know the typical routines in a house? 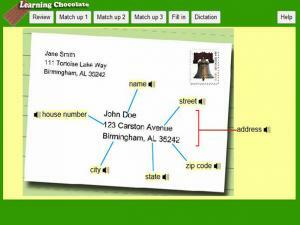 Practice what the family is doing with this matching game. Match the person in the house with their activity. 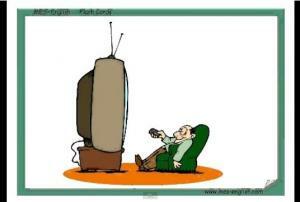 What things do you do during your day? This is a fun game to teach you some everyday actions, including the pronunciation and the written form. 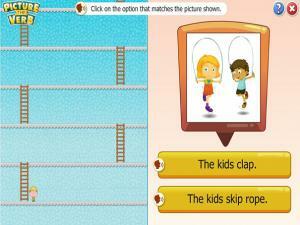 Play the matching games to test yourself until you've mastered them all! 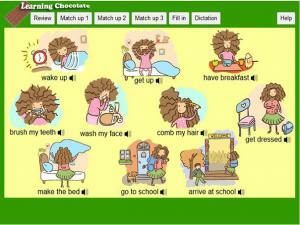 Vocabulary for activities that we do in the morning, in the afternoon, in the evening and at night. Watch Snow White and her seven dwarfs on a typical day. What do they do every day? 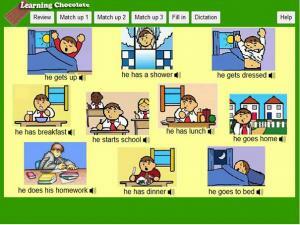 Many different kinds of click, listen and match activities are here to practice responsibilities in the house, do the washing up, iron the clothes, etc. 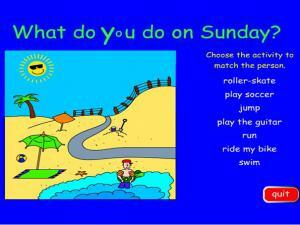 Most of the activities are matching the pictures of the activities with the names. Excellent practice. Nobody likes to do housework, but cooking and cleaning are daily necessities. 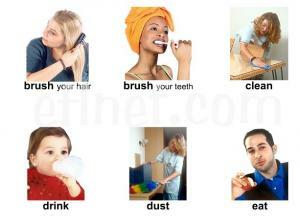 Learn how to say all the daily housework activities in English. This vocabulary list includes the pronunciation and the written form of each vocabulary word with matching games to test yourself until you've mastered them all! 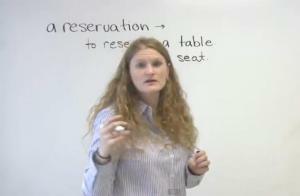 Learn the vocabulary needed to fill out a basic form in this video lesson. You will be able to give clear and correct information whenever you need to! 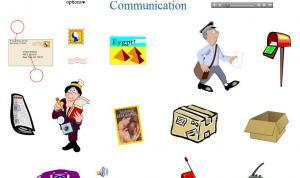 Practice English vocabulary related to communication, like mail, telephone, and types of media. Place your cursor over an image or text to hear it pronounced aloud. 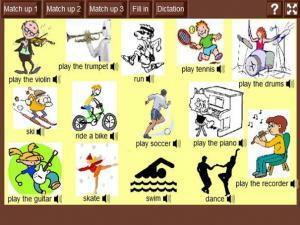 "Audio Quiz mode" is a great way to practice; to activate, click on "options" and then "Audio Quiz mode". When you hear a word, click on its picture. If you guess all of them correctly you win! Practice your knowledge of common English verbs with this easy, fast game. Click the picture or sentence and drag it to the box that describes the action. Watch the video, look at the picture of the action, listen to the action and then repeat! Easy and fun to go through daily actions you do everyday. Prepare yourself in English for your next trip with the most essential vocabulary! 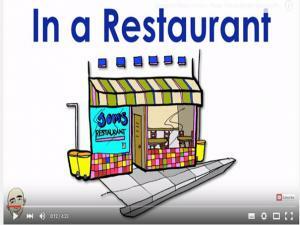 This interactive video lesson prepares you for restaurants, shopping, taxis, money and health and communication problems. There is a self-test practice section at the end of the video, too! 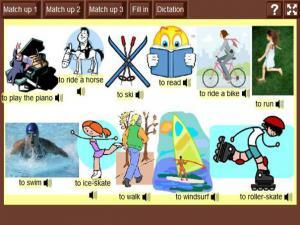 Learn verbs for expressing common daily activities in this set of video flashcards. 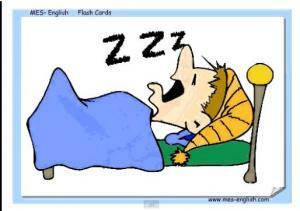 Listen to the English pronunciation as you hear each verb. 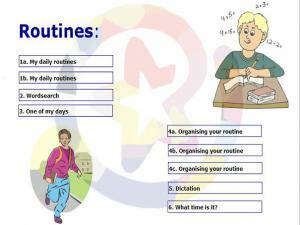 What is your daily routine? This is a fun game to teach you vocabulary phrases, including the pronunciation and the written form. 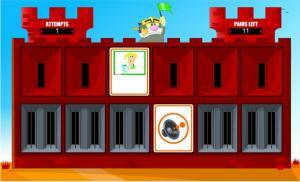 Play the matching games to test yourself until you've mastered them all! 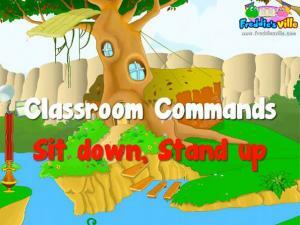 This is the second game that teaches Daily Routine vocabulary. 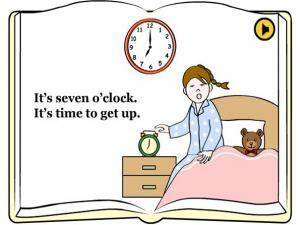 This time you begin at school and work your way through to bedtime! Learn the vocabulary phrases, including the pronunciation and the written form and play the matching games to test your new understanding. 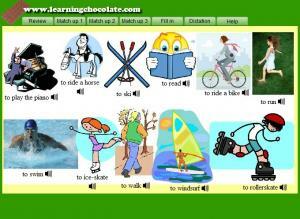 This is a resource for learning action vocabulary words. 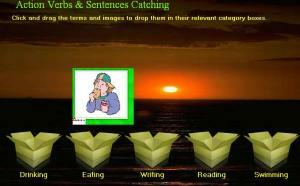 Review the pictures and words first, then choose one of the 5 interactive exercises to practice your vocabulary skills. 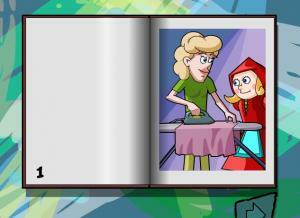 This is a nice game to learn how to greet and say goodbye to someone. 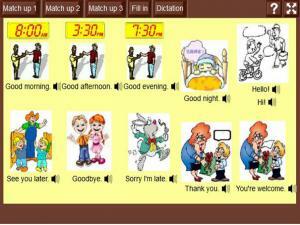 There are different phrases to learn for the different parts of the day. Vocabulary exercises to help learn different actions. 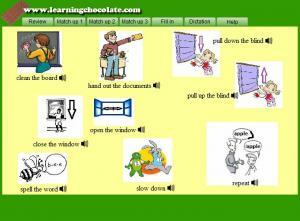 There are 3 exercises to complete: match the words and pictures; read the sentences and choose the correct answer; and write the actions to fill the gap. 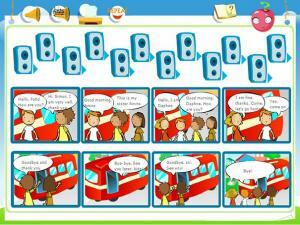 This game helps you practice vocabulary used in greeting and saying good bye to people. 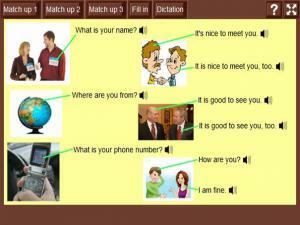 It also tests your listening and reading skills by asking you to match the speech bubbles with the correct audio for each vocabulary phrase. Vocabulary exercise to help learn words to talk about what you do every day. 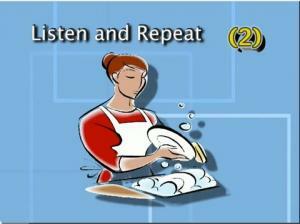 You have audio, images and reading exercises to practice your listening and vocabulary skills. 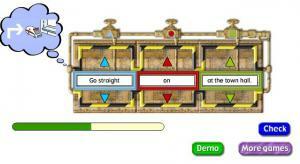 These exercises give you vocabulary practice of words you might use when you stay in a hotel. 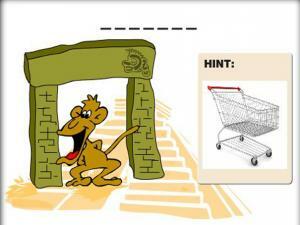 Look at the pictures, listen to the words and choose the correct answer to fill in the sentence gaps. 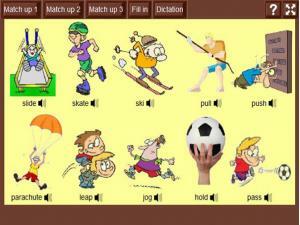 A vocabulary game to test your knowledge of different activities. 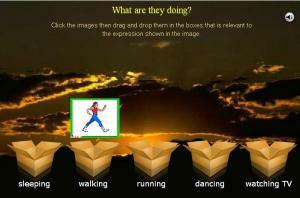 Look at the pictures showing actions and drag the right words to the pictures. This site has 9 different exercises for you to try all about your daily routine. What do you do when you get up? What time do you go to school? 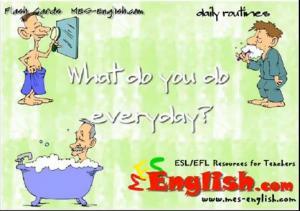 Check your answers as you go and see how well you know your daily routine. 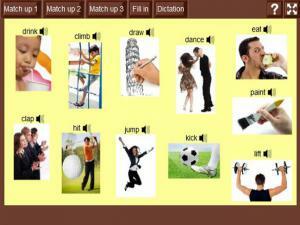 A vocabulary game to teach some basic, everyday actions. 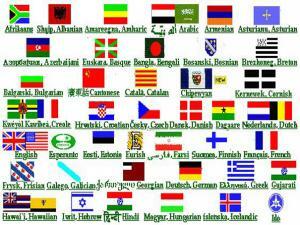 Look at the pictures, listen to the pronunication of the word and test yourself to spell it correctly. 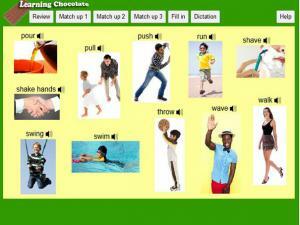 A vocabulary game to help you practice introducing yourself to someone. 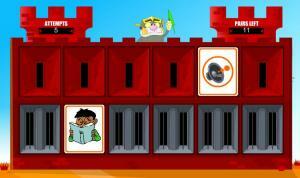 Review the vocabulary, then play the games to check your spelling, listening and writing skills. 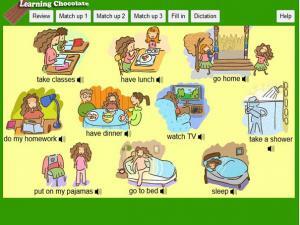 Online picture dictionary for lots of daily routines, things you do at home and leisure activities. Look at the pictures and read the word and phrases. 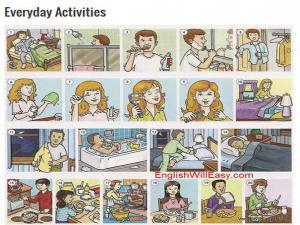 Review these action verbs for daily activities by rolling over each picture and listening to the audio. Once you think you know them all, play the games and test your knowledge. 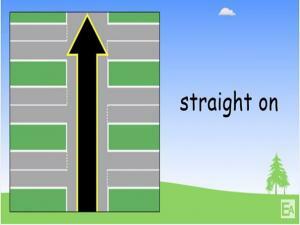 In this short lesson you will learn 10 English directions and phrases. 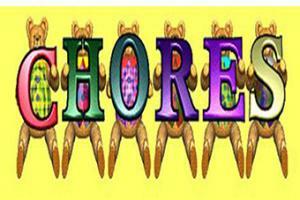 Each word or phrase is repeated 3 times so you can clearly remember how to pronounce that vocabulary. 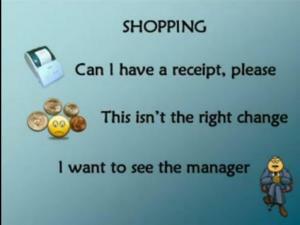 You will also see the English words on the screen twice so that you will know how to read and spell those words. 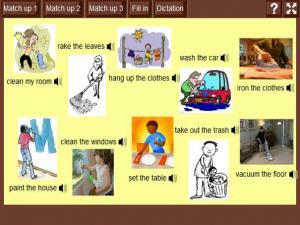 This site gives you vocabulary practice for all the chores you can do around the house and in the garden. 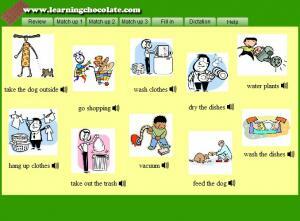 Match the correct words to the pictures and then decide what chores you can do with the different tools.